This is a Wyeast Culture Collection strain and is released April through June. Profile: A blend of Saison yeast and Brettanomyces creates a dry and complex ale. Classic earthy and spicy farmhouse character meets tropical and stone fruit esters; aging brings elevated Brett flavor. Expect high attenuation with this blend. Please note: It is highly recommended that a cold pack be purchased when ordering liquid yeast. High Gravity cannot guarantee the viability of liquid yeast if it fails to work unless it was purchased with a cold pack. You can add it to the order by checking the cold pack box near the bottom of the page before adding the yeast to the cart. At Wyeast Laboratories, their goal of helping both professional- and home-brewers brew beers that are "true-to-styleâ€ has led to the collection of several hundred strains of yeast over the past 20+ years. While their regular product line of yeast strains featured in our Propagator and Activator packages includes 46 strains for beer and 14 more for wine making, this represents only a fraction of the strains in their archives. Therefore, Wyeast exposes their Private Collection - featuring strains from their archives, new strains as they obtain them, and even occasionally Proprietary Strains from their craft brewery partners such as Rogue Ales Pacman Ale yeast and Flying Dog Ale yeast. 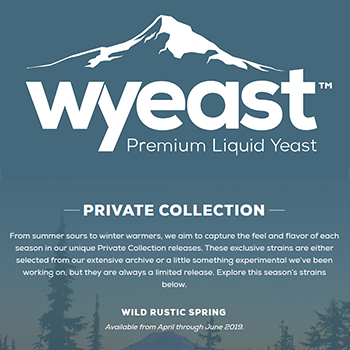 Wyeast features up to 3 strains in each Private Collection which runs for 3 months. Wyeast's Private Collection is interactive. You may voice your requests for the strains they feature by contacting them at privatecollection@wyeastlab.com. While they cannot respond to every message, they will read and log every message, and use this feedback when determining what strains to include in future promotions. If there is a strain youâ€™d like them to feature, a brewery whose Proprietary Strain youâ€™d like to brew with, an award-winning beer recipe youâ€™ll allow them to post on their website, or if youâ€™d like to provide Wyeast with any feedback at allâ€¦ please contact them!